More than seven years after the recovery began in mid-2009, inflation remains below the central bank’s 2-percent target, indicating that the economy is still operating below potential. As of July, consumer prices were up just 0.8 percent from a year earlier. Excluding volatile food and energy goods and services, they were up 1.6 percent. Worse, markets appear to be losing confidence that the Fed will ever reach its target: Yields on Treasury bonds suggest that traders expect inflation to average less than 2 percent five to 10 years from now. As the experience of the Bank of Japan indicates, restoring such confidence is not easy. The Fed is also falling short of its goal of “maximum” employment. Although the unemployment rate has returned to its 2007 level of 5 percent, the fraction of Americans in their prime working years who have a job remains well below its pre-recession level. He wants Fed to provide more stimulus, which he thought was not likely. In his opinion, either of two likely scenarios – raising rates by quarter percentage point or doing nothing, which FOMC did – will be wrong move. We are not trained economist like Prof. Kocherlakota or many members of FOMC, but we do believe that there is some merit in Prof. Kocherlakota’s argument. On September 9, market got a panic attack when some of the tea-leaf readers said that the Fed may raise rates. The bonds took a hit and S&P 500 declined by -2.5%. Market technicals were at low levels for such an extended period that increased volatility was warranted, something that we noted in these bog-pages earlier, and that is what market got. US 10-year Treasury yields rose to a high of 1.752% on September 13 from a low of 1.519% on September 7. VIX, similarly, rose to a high of 20.51 from a low of 11.77. The bounce, again, was not very surprising. However, the bonds are finding it difficult to keep at those levels, which is also not surprising. U.S. Treasury yields have been in a downtrend for over thirty years. On monthly timeframe, the 10-year U.S. Treasury yield has been making lower highs and lower lows. Any bounce off the lows do not last long and the downtrend again resumes. 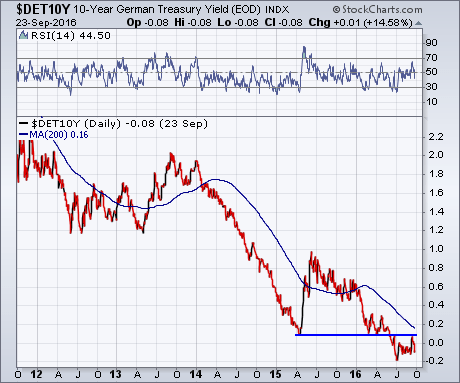 The yield made all time lows of 1.394% in July 2012 and then bounced up. The bounce reached 3.036%, lasting till December 2013, when it faced the resistance level formed by the lows of June 2003. Then it turned tail and tested the lows again July 2016. Since 1994, every time the 10-year yields have tested the lows, they have bounced up but the bounce lasted only few months. In December 1994, the yields tested the lows of November 1993 and the bounce lasted till July 1996. In November 2001, the yields bounced up till March 2002. In 2008, the yields broke below the previous low before bouncing up. In 2011, again they broke below the lows of 2008 before bouncing after 2012 lows. The odds are still slim that the current test of 2012 lows will produce a bounce that will last long or high. Also, MACD is not in the oversold territory at the moment. In the past, each time the yields had significant bounces, the MACD was much lower that its current level. If the bounce persists this time then it will form a divergence, which has bullish connotations. Analyzing the weekly-time frame we note that the 10-year yield is once again at a critical juncture. After making a low in July 2012, yield started to rise and made a swing low of 1.614% at the end of April 2013. Price tested this level in late-January 2015 and in early February-February 2016. Following the unexpected success of Brexit camp in the U.K. referendum, yields broke that level. Now, the bounce since July 2016 low of 1.336% is finding resistance at that broken support level. The weekly chart is also showing an emerging up-sloping flag. Usually, this chart formation has bearish implications, though, sometimes it fails like the pattern that formed from July 2012 to April 2013 and resolved with an upside break. The chart pattern on daily timeframe give us some clues. One thing that becomes clear is that each time a support level was broken it became resistance zone for the bounce up. 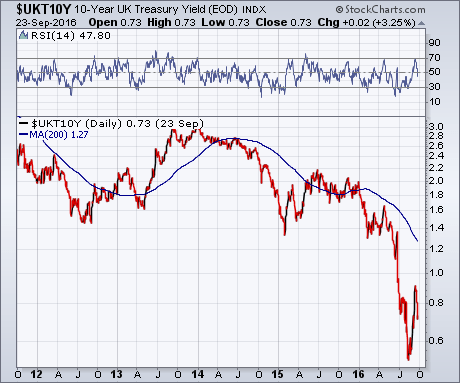 In March-April 2015, yields formed a swing low. The price came close to testing in August-October 2015. The swing low was eventually broken in February 2016. The bounce from the February 11 2016 lows found the resistance zone at the previous broken support level – usually support-resistance act as a zone and not one specific number. The low of February 11 was broken in late-June and the bounce from July 6 low stopped at that broken support, which became a resistance (lets call it R1). The price jump on September 9 broke above R1 but met another resistance at a higher level – the swing lows of April 7 and May 13. Since then, the yields have fallen down and are again below the resistance R1. Unless the yields go above September 13 high of 1.752%, the chances are good that they will decline. One bearish chart pattern is presently in play. Yields fell from the swing high levels of November-December 2015 – 2.277% – to 2.325% – to the low of 1.567% on February 11 2016. The yields, then, fluctuated up a down and formed a symmetrical triangle. The first bounce, to 2.002%, was between 50%-to-60% of the decline. This pattern is like a pennant and became relevant when the yield broke below the lower bound of the triangle on June 3 2016. The decline has not yet met the measured target of the pennant pattern, which is between 1.23% to 0.88%. The target range is too large but that is because the formation is not strictly within the guidelines (triangle took too long to finish), nevertheless, it is still relevant until yield break above 1.752%, the high of September 13. Another pattern – an ascending triangle – is emerging. The lower bound is the uptrend line from the low of September 9 and the upper limit if formed by the resistance of June 23 high. A break above 1.752% will make it a bullish pattern with an upside target near 2.34%. A break below 1.50% will make it a bearish pattern. The sovereign yields around the world jumped up on September 9 but since then they has shown little follow through action and are mostly down below September 8 levels. On September 8, 10-year German Govt. Bond Yield was -0.062%, 10-year U.K. Govt. 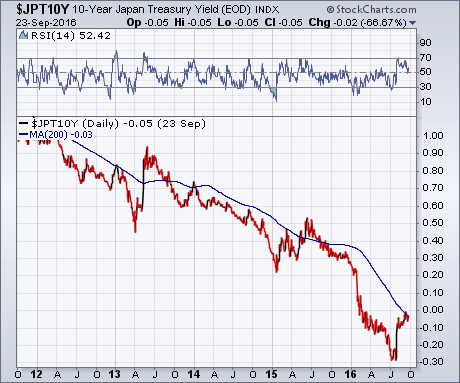 Bond Yield was 0.758% and the 10-year Japanese Govt. Bond Yield was -0.034%. On September 26, these yields declined to -0.116%, 0.697% and -0.064% respectively. None of these charts are showing any signs of reversal. That may change if the yields linger at these levels for some time. In our September Intermarket Report, we noted few fixed-income ETFs that were showing relative strength compared to S&P 500. They still show upside potential. 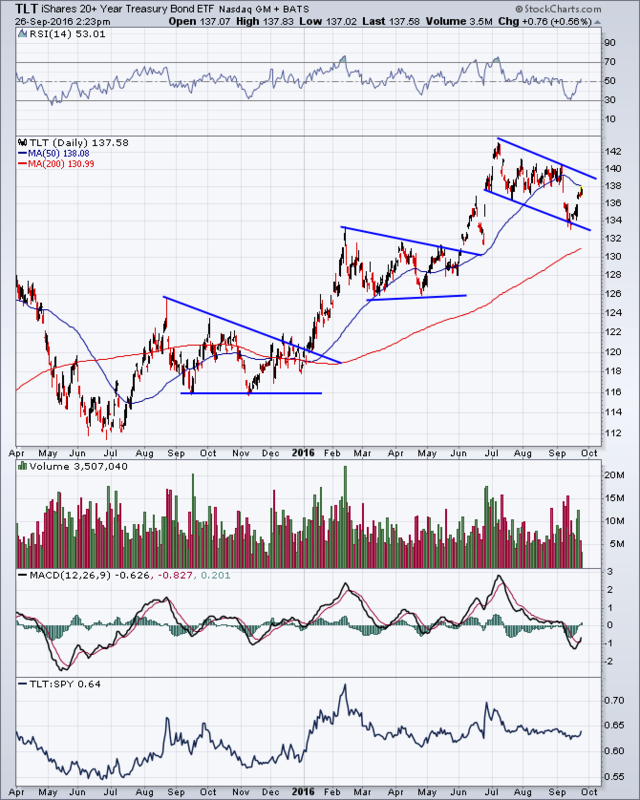 iShares 20+ Year Treasury Bond ETF, TLT, is forming a down-sloping flag. It is rising from the lower limit of the flag and a break above 139-140 would be bullish. The MACD is also making a bullish crossover below zero – fast line is crossing over slow line. Previous such cross overs mostly pushed the EFT higher. 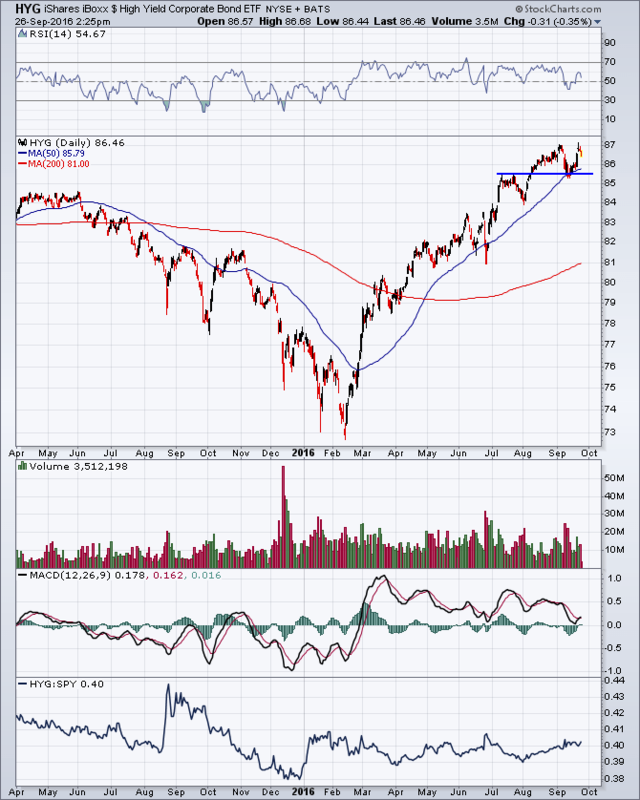 PowerShares Emerging Markets Sovereign Debt Portfolio ETF, PCY, is in uptrend. It is again turning up from a pervious swing low after a decline. Its MACD is also showing a bullish crossover. 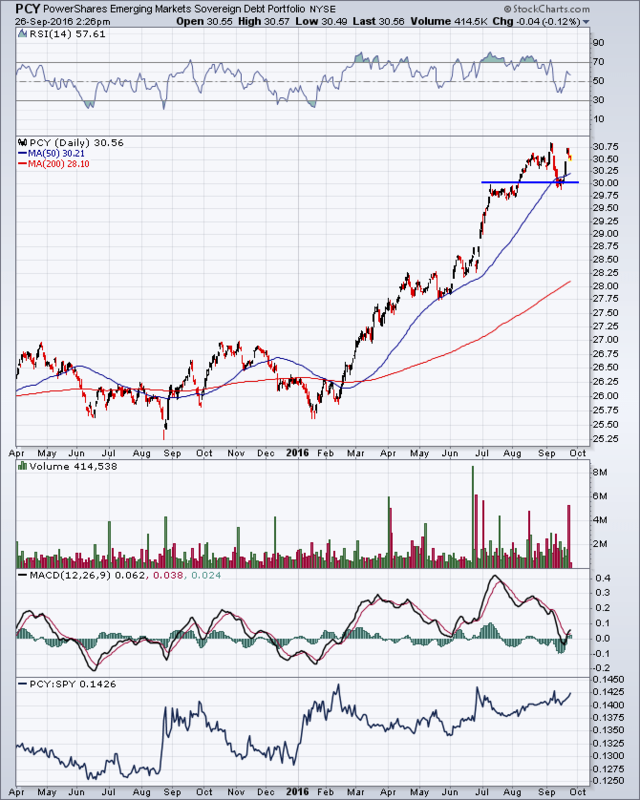 It needs a break above 30.95 to resume uptrend. Its earlier MACD crossovers were more bullish than TLT’s. iShares High Yields Corporate Bond ETF, HYG, and JP Morgan USD Emerging Markets Bond ETF, EMB, are also showing similar chart patterns. 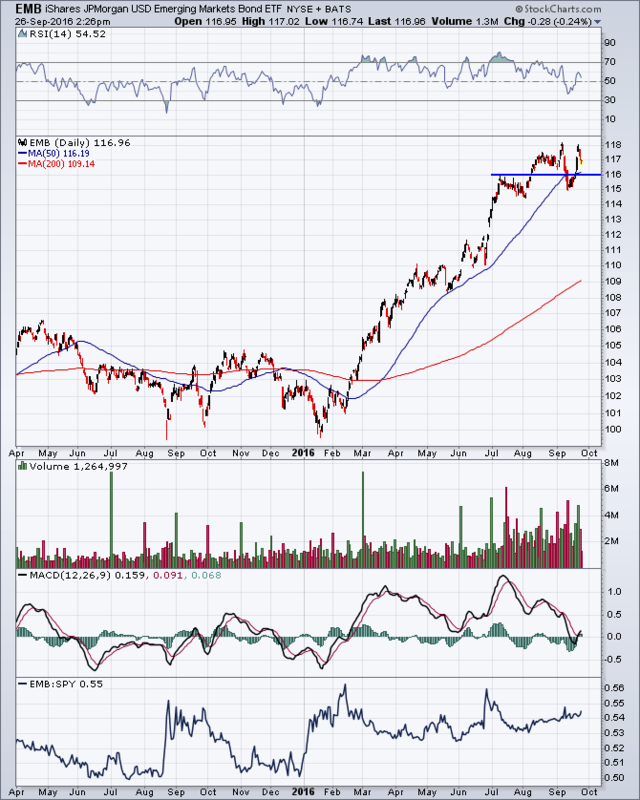 For HYG, a break above 87.15 will resume the uptrend. For EMB a break above 118 would be bullish with a potential target near 121-123. Its recent MACD crossover have been more reliable in terms of upside potential. Seasonally, EMB, PCY and HYG have always closed higher in October than September since 2010. TLT has been up only two times – in 2013 and 2014. In 2008 and 2009 all were down.